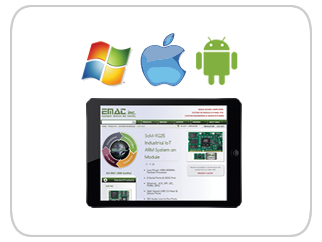 Industrial IoT & M2M | EMAC Inc. The term IIoT (Industrial Internet of Things) is often encountered in the manufacturing industry, referring to the industrial subset of the IoT (Internet of Things). 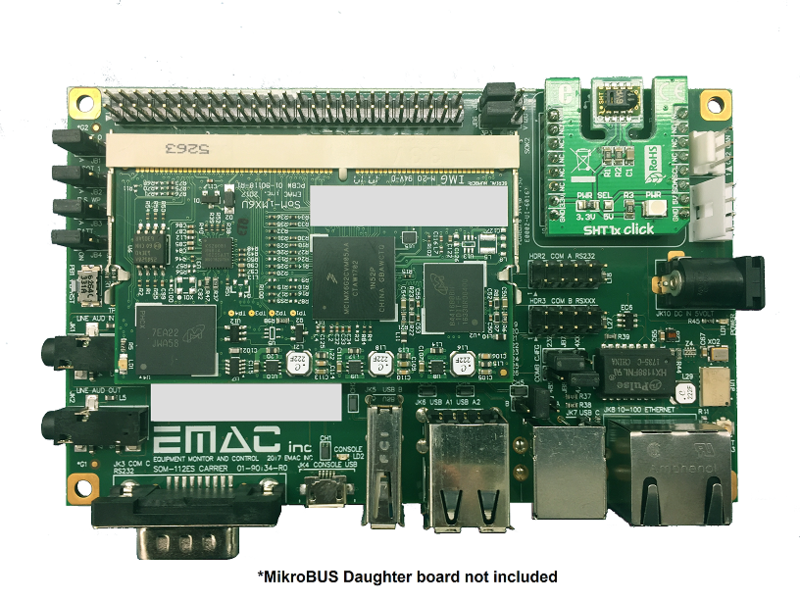 EMAC Inc. provides the single board computers, system on modules, development carrier boards, and embedded programming expertise to develop custom and semi-custom Machine to Machine (M2M), Industrial IoT, and Industry 4.0 solutions. Our next generation digital Industrial products are used by companies to add the features and functionality customers are demanding. Talk to one of our representatives to learn how you can create a semi-custom or fully custom solution to add Wi-Fi, Zigbee, Bluetooth, remote access to your next product. We have the experience and expertise to simplify your choices and get your product to market. It all begins with sensors collecting data. 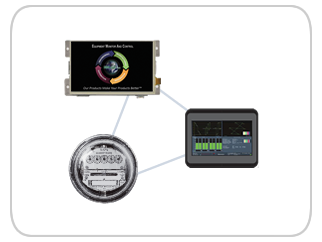 These sensor connections enable data to be quickly transmitted and can operate safely in many areas. 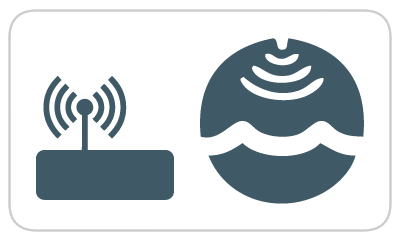 Wireless sensors make it an option for monitoring equipment systems that in the past were either too expensive or difficult for a wired connection. 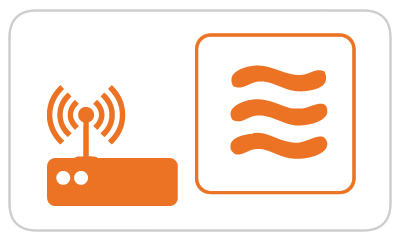 RFID can be used to track and monitor efficiently and accurately. It can tell you what an object is, where it is, and its condition, making it integral to the Industrial Internet of Things (IIoT). The applications of a system are endless and their range unlimited. RFID can automate inventory and asset-tracking in many industries, such as medical, industrial, retail, business, and much more by identifying the product, enabling recalls, if an item is defective or dangerous. For example, food, toys, medication, analytics, Kanban systems etc. Consumers potentially have fewer unavailable items with easier returns. Ability to wirelessly configure, lock, and unlock devices. Control of devices in several and/or specific areas. These are just a few examples of how a RFID system can efficiently improve the way you track and trace items, with less reliance on manual processes. This is turn lowers the cost of the data you collect. What is a Current Sensor? 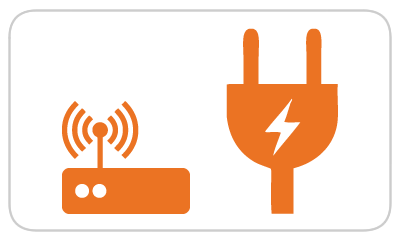 A current sensor is a device that detects electric current (AC or DC) in a wire and generates a signal proportional to it. 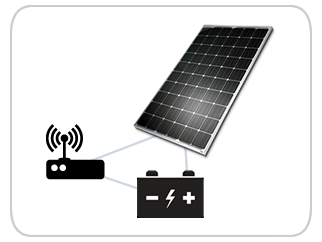 The generated signal could be analog, current or even digital output. It can then be utilized to display the measured current in an ammeter or can be stored for further analysis in a data acquisition system or can be utilized for control purpose. Analog output, which duplicates the wave shape of the sensed current. Bipolar output, which duplicates the wave shape of the sensed current. Unipolar output, which is proportional to the average or RMS value of the sensed current. What are applications of a Vibration Sensor? A logger comprises sensors such as accelerometers, storage media, a processor and power supply. The sensors measure and store shocks either as the entire waveform, summary data, or an indication of whether a threshold value was observed. Some devices have accelerometers built into the unit while others can use external accelerometers. The processor processes the measured data and saves it on the storage media together with the associated measurement times. This allows the measurement data to be retrieved after the measurements have been completed, either directly on the logger or via an interface to a computer. Some have a RFID interface. The software is used to present the measured data in the form of tables or graphs and provides functions for the evaluation of the measurement data. The shock and vibration data is either recorded continuously over a defined time period or on an event-driven basis where the recording of data is determined by certain criteria. Employing such an event-based measurement method allows the recording of specific shocks that exceed a critical length of time or strength. Some have wireless capability such as Bluetooth transmissions to smartphones. Measure accelerations in motor vehicles, for example during the reconstruction of road accidents. Monitor machinery used on production lines that are sensitive to shocks or vibrations. Monitor and reduce wear in industrial plants and for increasing the performance of machines. Measure vibrations in wind generators. Record movement data for health management, patient monitoring. Animal monitoring of breathing, walking, standing, lying and sleeping behavior. Measuring acceleration for avalanche emergency systems. Determine the g-forces acting on people when riding roller coasters. Establish accelerations for objects on conveyor belts. What is a Flow Sensor? A flow sensor is a device for sensing the rate of fluid flow. Typically a flow sensor is the sensing element used in a flow meter, or flow logger, to record the flow of fluids. As is true for al l sensors, absolute accuracy of a measurement requires a functionality for calibration. There are various kinds of flow sensors and flow meters, including some that have a vane that is pushed by the fluid and can drive a rotary potentiometer, or similar devices. Other flow sensors are based on sensors which measure the transfer of heat caused by the moving medium (Thermal mass flow meter). This principle is common for microsensors to measure flow. Flow meters are related to devices called velocimeters that measure the velocity of fluids flowing through them. Laser-based interferometry is often used for air flow measurement, but for liquids, it is often easier to measure the flow. Another approach is Doppler-based methods for flow measurement. Hall Effect sensors may also be used, on a flapper valve, or vane, to sense the position of the vane, as displaced by fluid flow. What is a Level Sensor? Level sensors detect the level of liquids, fluids and fluidized solids, including slurries, granular materials, and powders that exhibit an upper free surface. Substances that flow become essentially horizontal in their containers (or other physical boundaries) because of gravity whereas most bulk solids pile at an angle of repose to a peak. The substance to be measured can be inside a container or can be in its natural form (e.g., a river or a lake). The level measurement can be either continuous or point values. Continuous level sensors measure level within a specified range and determine the exact amount of substance in a certain place, while point-level sensors only indicate whether the substance is above or below the sensing point. Generally the latter detect levels that are excessively high or low. There are many physical and application variables that affect the selection of the optimal level monitoring method for industrial and commercial processes. The selection criteria include the physical: phase (liquid, solid or slurry), temperature, pressure or vacuum, chemistry, dielectric constant of medium, density (specific gravity) of medium, agitation (action), acoustical or electrical noise, vibration, mechanical shock, tank or bin size, and shape. Also important are the application constraints: price, accuracy, appearance, response rate, ease of calibration or programming, physical size and mounting of the instrument, monitoring or control of continuous or discrete (point) levels. In short, level sensors are one of the very important sensors and play very important role in a variety of consumer/ industrial applications. As with another type of sensors, level sensors are available or can be designed using a variety of sensing principles. Selection of an appropriate type of sensor suiting to the application requirement is very important. A temperature sensor is a device, typically, a thermocouple or RTD that provides for temperature measurement through an electrical signal. A thermocouple (T/C) is made from two dissimilar metals that generate an electrical voltage in direct proportion to changes in temperature. Temperature Sensors monitor real-time performance and receive alerts when temperatures drift outside optimal range, production rates slow or quality issues arise. Manufacturers of food products, plastics, etc., rely on these to provide information efficiently and is a cost effective solution. What is Remote Location Monitoring? 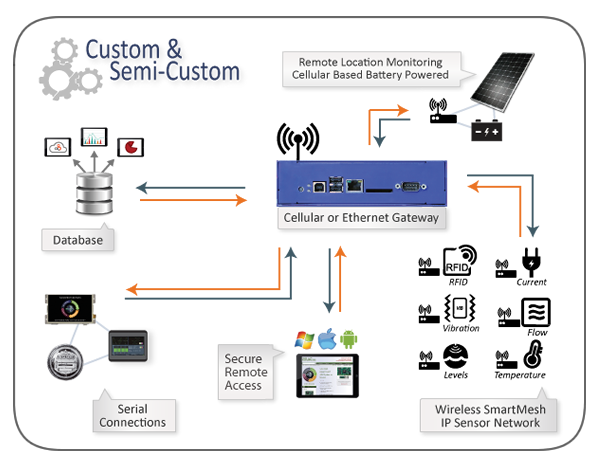 The function of a Remote Location Monitoring system is to collect real-time data and/or log data and remotely send the data in whatever transmission solution the user prefers. For example, a weather-based system may require a real-time solution, rather than just logging the data to a database. Graphical applications using the Qt Framework, on an EMAC product, can be accessed remotely and securely using VNC. VNC allows a client program on a vast array of systems, including Windows, Mac OS X, and Android, to control and view an embedded application. By default, the security of VNC is limited to the security of the network to which the device is connected. If the device is being accessed from within the same secure network, using VNC without any extra security is a secure method of connection. However, if the device is connected to an external internet connection, VNC is not very secure and is not recommended. For devices open to the internet, SSH with X11 forwarding is a very secure way to remotely access a Qt application. SSH with X11 forwarding can be setup to be accessible using a password or a public/private key system for even more security. A lot of new devices, such as sensors, and scales use a serial interface. This equipment is built for communicating and integrating with new technology. Serial connectivity has been developing considerable lines of serial conversion and isolation products. Serial connections are built tough for the most challenging environments and thus, are rugged and reliable. The Database or Cloud Infrastructure is the base of any Internet of Things (IoT) system. This cloud framework is used to gather information from and send commands and configuration to devices in the system. Provide an application platform to mobile and web clients. Consolidate with third-party Internet services, such as payment processing, weather prediction services, social media platforms, and calendar apps, and several more applications. 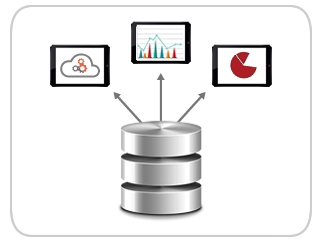 Collect and store data that can be analyzed by large data statistical methods making the entire system smarter. The Internet of Things presents a new set of challenges to database management systems. Large volumes of data must be acquired in real time, processing events as they stream, rather than on a schedule of intervals, and dealing with larger volumes of data than ever before. IoT has fewer data quality constraints. An application that collects data from a machine in some applications can tolerate the loss of data for a few minutes, yet still, monitor overall capabilities. Although IoT sensors generate data quickly, they do not necessitate the same kinds of transactions one finds in traditional business applications. It is crucial to find the right IoT database in order to properly handle IoT data requirements. However, to choose IoT database applications, we must adapt our knowledge about designing for business operations. Some of these new considerations include scalability, access data at ample rates, schema flexibility, integration with analytics tools and costs. IoT database applications must be scalable. Ideally, linear scalability so adding one more server to a node cluster increases turnout by 10%. IoT databases will usually be distributed unless the application collects a small amount of data that will not substantially increase. Distributed databases can run on commodity hardware and scale by adding new servers instead of swapping for a larger one. Distributed databases are especially befitting LaaS clouds, making it easier to add and remove servers from the cluster when needed. The database technologies to handle complex IoT operations are incredibly diverse. The various client/server, distributed or embedded in-memory/in-process database management systems are targeted for positions at different levels in the IoT, on the devices, or at the cloud level for data analytics. Fault tolerance is also needed for an IoT Database needs. If a node in the cluster is down, it should still accept read and write requests. Distributed databases make copies of data and write to multiple servers. If one server storing particular data fails, then another server stores a copy and will respond to the read query. Write requests can be controlled in a couple of ways. If the server would normally accept a write request goes down, another node in the server can accept the request and pass it along to the target server when it becomes online.